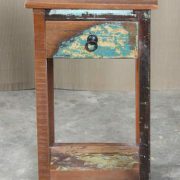 Small vintage teak bedside with panel sides and beautiful wood grain. 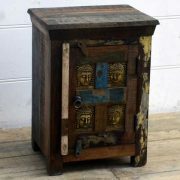 A really very charming piece, this bedside cabinet has very interesting contrasting wood grain. 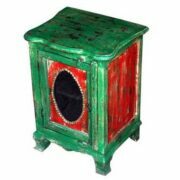 Made from teak, a wood that ages wonderfully, this unit has instances of both darker and lighter wood grain that contrast delightfully with one another under a natural glossy finish. The simple piece has a single cupboard door that opens outward to reveal an internal compartment divided by one shelf, creating two fairly generous storage spaces. 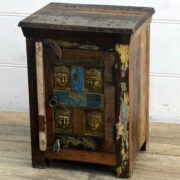 The cupboard sits on top of four small wooden feet. 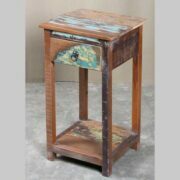 Perfect for use as a bedside or perhaps an end table, we are sure this little guy will find a home soon.